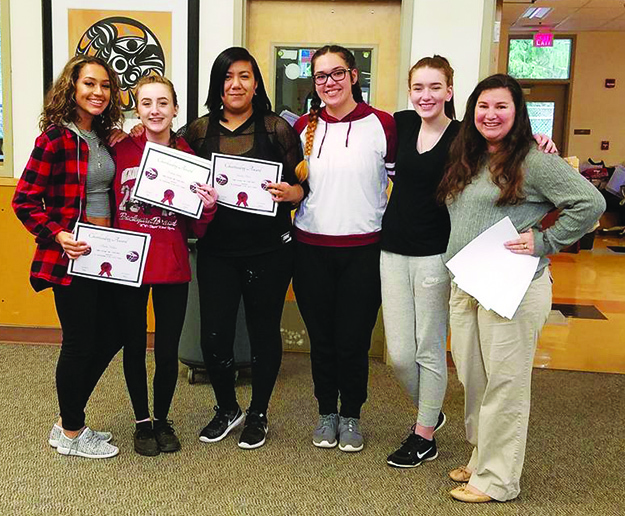 By Micheal Rios, Tulalip News; photos courtesy Heritage H.S. 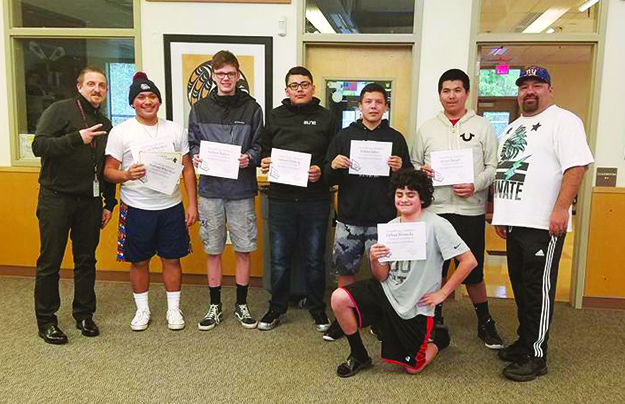 Tulalip Heritage High School faculty and coaches honored their Fall and Winter sports participants with a joint celebration and banquet-style potluck on Wednesday, March 29 in the Heritage Commons. With friends and family in attendance, the players took center stage and received recognition for their dedication to practice, constant improvement and teamwork during the sports season. Bringing cheer and halftime entertainment to every home and playoff game were the Heritage cheerleaders. They always kept a positive attitude, smiles on their faces, and were determined to keep the home crowds upbeat. The Hawks football team was short on eligible players this past season, but that didn’t stop them from showing up come game day and leaving their all on the field. After a narrow 2-point loss in their opening game, the football program showed out the very next game for a 51-26 victory in front of the home crowd. Lady Hawks volleyball had another productive season under coach Tina Brown. The girls opened the season with five straight victories on their way to a 9-6 regular season record and a trip to the postseason. At the 1B District playoffs, they dropped their first match before bouncing back with back-to-back Ws and earning a trip to Tri-Districts. Coaches Marlin and Cyrus “Bubba” Fryberg made the best of a rebuilding year for their boys basketball program. With so many new faces on the team there was a steep learning curve. The Hawks opened the season 1-6, but soon after found their identity and went 7-5 down the stretch to clinch a playoff spot. In the postseason, the boys played their best basketball and defeated two teams with better records to earn a Tri-District berth. 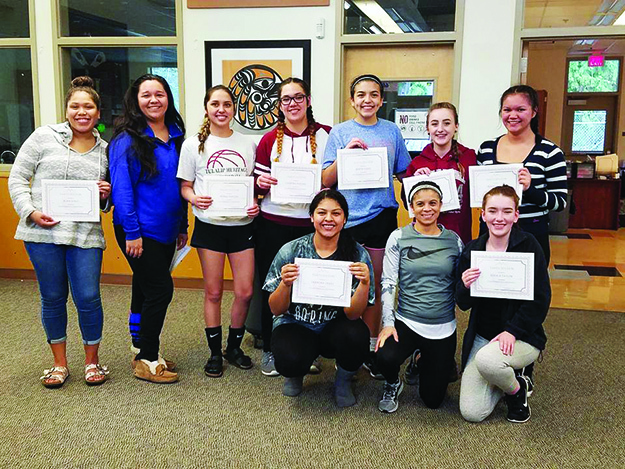 The Lady Hawks basketball program achieved the most this year. The girls carried a stellar record all season long on their way to battling for the NW1B regular season crown. Led by their Big 3 (Aliya Jones, Keryn Parks, and Deandra Grant), they finished the regular season 16-3. With two decisive victories to open the playoffs, the Lady Hawks matched up with inner-league foe Cedar Park Christian for the third time in the NW1B championship game. Back and forth for nearly the whole game, Cedar Park pulled away in the final minutes. It was a heartbreaking game for the Lady Hawks, but they bounced back admirably to win two more games at Tri-Districts and clinched consecutive trips to Regionals. 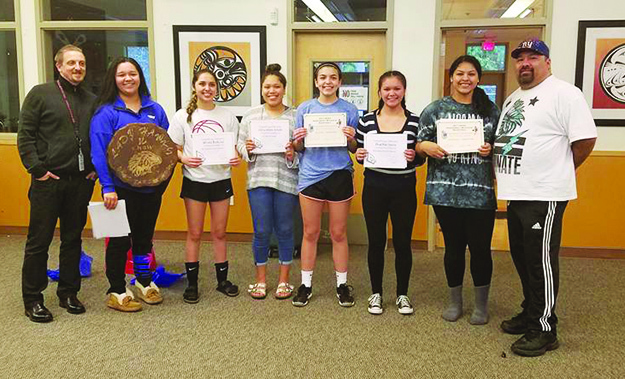 Coach Bubba Fryberg was recognized as Coach of the Year in the Northwest 1B League, while three of his players (Aliya, Keryn, and Deandra) were named to the All-League 1st Team. Additionally, Aliya earned All-State recognition with an honorable mention by the Associated Press. 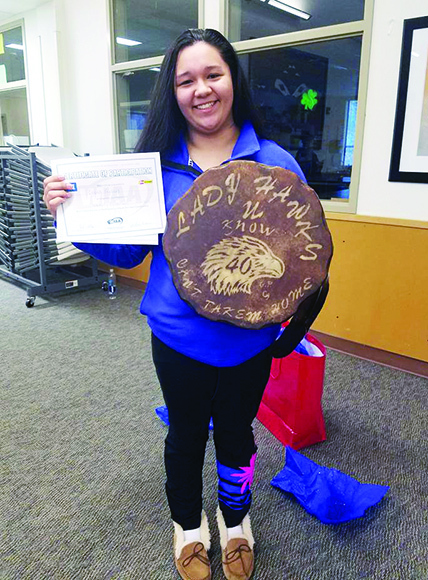 This entry was posted in News, Sports, Tulalip News and tagged Hawks, Heritage High School, Lady Hawks, sports, Tulalip Tribes by Kim Kalliber. Bookmark the permalink.